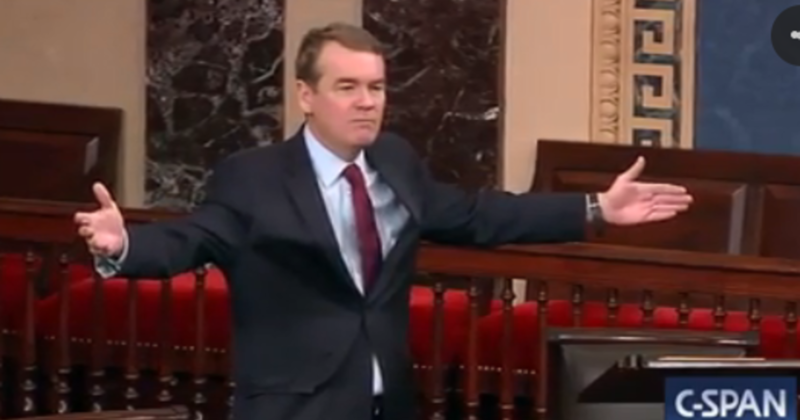 "These crocodile tears that the senator from Texas is crying for first responders are too hard for me to take," Bennet said, hitting Cruz for single-handedly orchestrating a 13-day government shutdown in 2013.
" When the senator from Texas shut this government down in 2013, my state was flooded! People were killed! People's houses were destroyed! Their small businesses were ruined forever! " Bennet said. "And because of the senator from Texas, this government was shut down for politics (and) he surfed to a second-place finish in the Iowa caucuses." Bennet then slammed Mr. Trump for insisting on building a border wall, and refusing to sign any government funding bill which does not include money for the wall. He excoriated Mr. Trump and his border campaign promise to length. "How ludicrous it is that this government is shut down over to promise the president of the United States couldn't keep it!" Bennet said. "This idea was going to build a medieval wall across the southern border of Texas, taking it from the farmers and ranchers that were there, and having the Mexican pay for it isn't true. That's why we're here." 3 which failed in the house, saying that the proposed $ 5.7 billion for the "rinky-thinking wall," that bill had included $ 46 billion for border security. "I'm not going to stand here and take it from somebody who's shut the government down while my state was flooded, or from a president who's saying he wants $ 5 billion to build some antiquated medieval wall that he said Mexico would pay for – when I helped write and voted for a bill that would actually have secured the border, "he said.
" This is a joke! " he finished. "This government should be open!" Bennet told "Meet the Press" later on Thursday afternoon that he was considering running for president in 2020. "I'm thinking about it," he said. "I think the country is moving in a terrible direction."